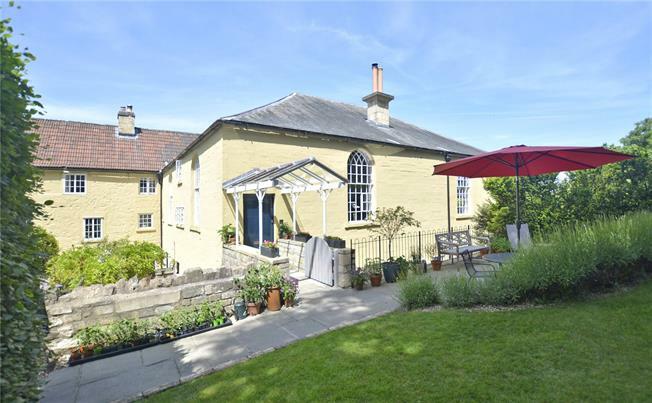 4 Bedroom Semi Detached House For Sale in Bradford-on-Avon for Guide Price £875,000. The entrance opens into a stunning reception room with double height beamed ceiling and galleried first floor mezzanine levels. This impressive room provides open plan accommodation including a sitting room, dining area and kitchen. An attractive full height arched window provides a wonderful aspect of the garden and a central wood burning stove in the sitting area provides a further focal point, especially on these chillier autumn evenings. Polished wooden flooring flows from the dining area into the kitchen which is fitted with a range of units under a wooden work surface. This versatile country home offers two separate bedroom floors. There is a self-contained lower floor comprising of a central hall with access to the garden, two bedrooms, shower room and a kitchen. Up on the first floor, the galleried landing provides an attractive sitting area and leads to a further bedroom and family bathroom. The top floor houses the master bedroom with a full height beamed ceiling, well designed storage and a smart en-suite shower room. Near to the pretty market town of Bradford on Avon is the charming village of Westwood with a National Trust manor, a pub, a garden nursery and a school. From the upper village, a pretty tree lined lane winds down to the picturesque hamlet of Avoncliff. Ancliff Square is located off this lane and is just a short walk to the banks of the Kennet and Avon canal and the River Avon. There is a super country pub, a tea room and direct access to the countryside and woodlands providing some picturesque walks/cycle rides along the Limpley Stoke valley. Amazingly, Avoncliff has its own railway station with the line forming part of the main South Wales to the South coast of England line with frequent fast connections to London Paddington and London Waterloo. The grounds of this unique and charming home are an important feature and are truly delightful. Approached via the private lane, a neat and tidy parking area provides covered barn style car ports and parking. This house has the benefit of a car port for parking and one that has been converted into an office space with heating, electricity and internet access. There is a further gravelled parking area. A pedestrian gate through a tall hedge leads into the private garden. The principal garden is laid to lawn with clipped hedges and box balls enhanced by softer planting with a calming palette such as lavender and alliums. There are mature specimen trees and further well stocked flowerbeds with a choice of gravel and pennant terraces to sit out and enjoy the gardens and the far reaching views. A productive vegetable garden adds to the idyll of this location. Additionally, there is a Grade II Listed building, originally built as a drying house, which is a great focal point of the garden. General Information. The 12 properties of Ancliff Square have a Management Company that own the Freehold. There is a £100pcm service charge. There is mains electricity with a modern electric boiler controlled by power saving Nest which can be programmed remotely using an app. There is private drainage for the square.